BMW is going to reveal Vision iNext concept soon as the company released a new teaser to increase the buzz around the upcoming model. 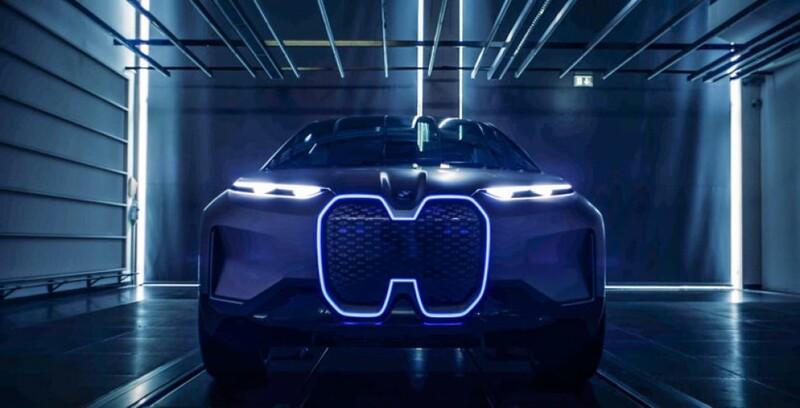 The latest teaser video reveals front design of Vision iNEXT concept as the company has given big kidney grille and it is slightly different from other BMW models. The Vision iNEXT also gets a blue lighting on the outer edge of the kidney grille and it is an EV, so the grille will be closed type to reduce drag. The company has also given two air-curtains on the front bumper, which will channel air to the front wheels. Like most of the modern concepts, this one also gets slim LED headlamps. The new teaser video also confirms that upcoming model is a crossover rather than hatchback or sedan as it was not visible in earlier teasers. The Vision iNEXT comes with cameras instead of conventional mirrors and the roofline is similar to what we have seen in other BMW models like X2 and X3. BMW has also given good ground clearance for the concept and it gives SUV riding position for the Vision iNEXT. The rear gets LED tail lamps along with the faux diffuser. Some of the design cues are similar to Vision NEXT 100 concept, which made its global debut last year. The interior is not yet teased, but it will be futuristic like other concept models. From the teaser, we can confirm that the concept has four seats, but whether it will come with a flexible seating arrangement is not known yet. The Vision iNEXT will be loaded with lots of technologies and advanced features. The concept will be powered by an electric motor and it will be packed with autonomous driving tech also. BMW is yet to confirm when they will reveal the new concept and a production model based on the concept is expected to join the lineup after 2020 as the company is working on multiple new EVs for future.